A new experimental method permits the X-ray analysis of amyloids, a class of large, filamentous biomolecules which are an important hallmark of diseases such as Alzheimer’s and Parkinson’s. An international team of researchers headed by CFEL scientists has used a powerful X-ray laser to gain insights into the structure of different amyloid samples. The X-ray scattering from amyloid fibrils give patterns somewhat similar to those obtained by Rosalind Franklin from DNA in 1952, which led to the discovery of the well-known structure, the double helix. The X-ray laser, trillions of times more intense than Franklin’s X-ray tube, opens up the ability to examine individual amyloid fibrils, the constituents of amyloid filaments. With such powerful X-ray beams any extraneous material can overwhelm the signal from the invisibly small fibril sample. 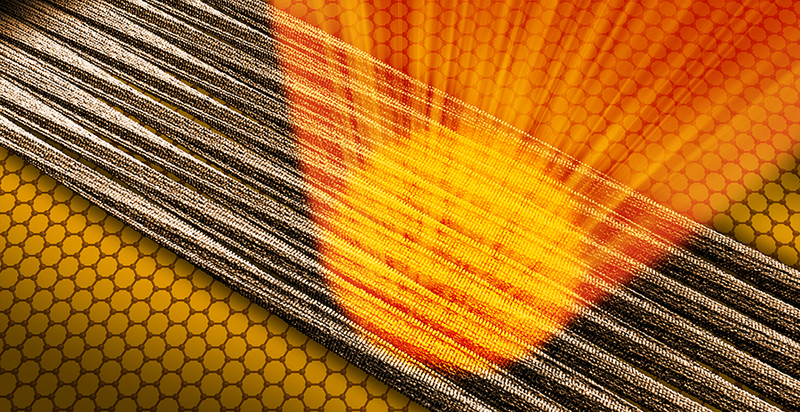 Ultrathin carbon film – graphene – solved this problem to allow extremely sensitive patterns to be recorded. This marks an important step towards studying individual molecules using X-ray lasers, a goal that structural biologists have long been pursuing. The scientists present their new technique in the current issue of Nature Communications. In order to gain access to structure information of such heterogeneous samples in the future, the team opted for a new experimental approach. 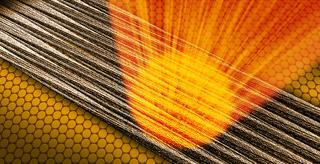 Instead of suspending the individual amyloids in a carrier fluid the scientists placed it on an ultrathin solid carrier made of graphene, in which carbon atoms are arranged in a hexagonal pattern rather like an atomic honeycomb. “This sample support has a double benefit,” says Professor Henry Chapman of CFEL, who is a lead scientist at DESY. “For one thing, graphene is just a single layer of atoms thin and in contrast to a carrier fluid hardy leaves a trace in the diffraction pattern. For another thing, its regular structure makes sure the protein fibrils all align in the same direction – at least in larger domains.” The diffraction patterns of multiple fibrils overlap and reinforce one another, much like in a crystal, but there is virtually no disruptive background scattering as in the case of a carrier fluid. This method allows diffraction patterns to be obtained from fewer than 50 amyloid fibrils, so that the structural differences emerge more clearly. “We have observed characteristic asymmetries in our data which suggest that our technique could even be used to determine the structure of individual fibrils,” says Seuring. The scientists tested their method on samples of the tobacco mosaic virus, also first examined by Rosalind Franklin, and which forms filaments of a structure that is now known in great detail. The test did in fact provide structural data about the virus with an accuracy of 0.27 nanometers (millionths of a millimeter) – corresponding to a resolution almost on the scale of a single atom. The examination of distinctly smaller amyloid fibrils made of endorphin as well as amyloid fibrils made of the hormone bombesin, which is involved among other things in certain types of cancer, also provided some structural information, with an accuracy of 0.24 nanometers. Although the data was insufficient for calculating the complete structure, the study shows great promise for structural retrieval when more data becomes available, and opens up a new path for the structural analysis of amyloids using X-ray lasers. “It is amazing that we are carrying out very similar experiments as Franklin did, but are now reaching the level of single molecules,” says Chapman.